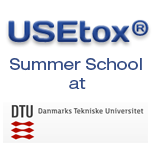 The Technical University of Denmark is organising the USEtox 2.0 course as a PhD course from 27 June until 1 July. The course will provide an overview of multimedia chemical fate modelling, multi-pathway human exposure modelling, ecosystem and human health effects modelling, and comparative indicators for human-toxicological and ecotoxicological impacts. Course participants will be guided through a series of examples in which they will develop characterization factors using the latest USEtox scientific consensus model release. Main course objective is that participants learn how USEtox can be used in various applications, including the prioritization and ranking of chemicals within LCIA, product environmental footprinting and other comparative assessments. Participants will have hands-on access to all model, data, documentation and reading files during the course and will be able to take all files back home for free. New substances will be characterized and participants may bring their own list of substances of interest for the exercises. Registration is open until 31 May. Get more information on this event. Consult the USEtox 2.0 flyer. Consult the USEtox page on our website. Consult the official USEtox website.